← Ellery Adams. Books by the Bay Mysteries. Kathryn O’Sullivan. Foal Play. New York: Minotaur Books, 2013.
Who killed Myrtle Crepe? That’s the question lingering on the minds of the townspeople of Corolla. Not many people were fond of Myrtle. A retired schoolteacher and the despotic head of the Lighthouse Wild Horse Preservation Society, Myrtle was known for her terse and domineering manner. Myrtle made it difficult for anyone to like her. Even her son Bobby and her sole companion Nellie Byrd struggled to overlook her demanding attitude. But did someone hate Myrtle enough to want her dead? Gruesome things have been turning up around Corolla lately. Immediately prior to Myrtle’s death, the burned body of a John Doe washed ashore. News of the murder entices Fire Chief Colleen McCabe into the beginning stages of the investigation despite well-meaning warnings for Colleen to mind her business from her best friend, Sheriff Bill Dorman. In the past, Colleen has demonstrated a tendency to conduct her own “unofficial” investigations without solicitation from the local police force. With her tenacious Irish roots, Colleen is a tough protagonist, and definitely not one to be deterred from solving a mystery. She single-handedly whipped the firemen of Station 6 into shape and refused to tolerate any insubordination. Colleen is not afraid to go with her gut and get her hands dirty. With her trusty Border Collie, Sparky (who has a nose for sniffing out fire) alongside her, Colleen winds up at the center of all the action. Although she is in for a few bigger shocks than she could ever imagine. Kathryn O’Sullivan is a first time novelist. 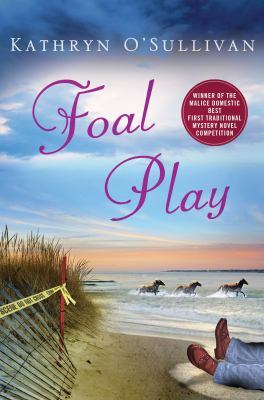 With the offbeat characters, the coastal setting, and the wild horses, O’Sullivan emphasizes local color in Foal Play. She formulates many comedic encounters and interweaves them between more serious moments and surprising plot developments. Readers interested in mystery and and Outer Banks enthusiasts will enjoy this novel. Foal Play is a great read to get in the mood for summertime.